The kidnapping of three Israeli teenagers in the West Bank last week has triggered an enormous and ongoing Israeli crackdown on Hamas, causing the organization to suffer a setback to its presence in the Palestinian territories. Eyal Yifrach, 19, and 16-year-olds Gilad Shaar and Naftali Frenkel had been hitchhiking in the Gush Etzion area near Hebron before suddenly vanishing Thursday. 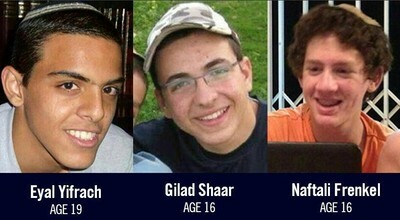 Israeli officials say their assessments leave no doubt that Hamas snatched the teenagers. In the ensuing days, the Israeli defense establishment launched a two-pronged campaign called Operation Brother's Keeper. The first pillar of the response revolves around a classified search for the abductees, led by the Shin Bet [Israel Security Agency]. The domestic intelligence agency maintains a tight grip on the West Bank, and has been able to thwart 44 previous kidnap attempts since the beginning of 2013. It is now at the center of an intensive large-scale effort, and is directing infantry forces to areas where the missing boys might be held. Additionally, the IDF has imposed a partial closure on the greater Hebron area, enabling civilian life to continue, but placing Hamas under real pressure. The second pillar of the response has seen a series of raids across the West Bank by IDF units, resulting in the arrest of more than 200 security suspects so far, most of them Hamas members. To carry out the raids, the IDF sent reinforcement battalions to the West Bank, and a total of 10 brigades, backed by special forces and intelligence units, are currently launching wave after wave of arrests of Hamas members. According to senior IDF sources, the raids are not only targeting armed Hamas cells, but also the organization's political networks, religious centers aimed at the spreading of Hamas ideology, and financial nerve centers. Nearly all of Hamas's leadership in the West Bank is in custody, including figures like Hassan Yousef, and the chairman of the Palestinian legislative council, Aziz Dwik. The aim of this effort is to roll back Hamas's ambitions to become a dominant force in the West Bank, thereby creating long-term security. 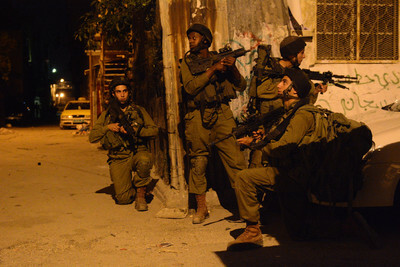 Some raids, such as Monday night's wave of arrests launched by 1,000 infantry soldiers in Nablus, turned up a sizeable cache of automatic weapons, grenades, and explosives, while others resulted in the IDF seizing terrorist funds and documents that have intelligence value. The development has placed the tenability of the Fatah-Hamas reunification process in jeopardy. The Fatah-dominated Palestinian Authority is under heavy pressure to distance itself from Hamas's kidnapping. One PA official indicated the reunification deal would be null and void if Hamas is found responsible. As a result, say senior Israeli security officials, the attack has strategically harmed Hamas, to the extent that the terror organization will end up regretting it. The officials have indicated that the campaign of raids will continue for an extended period. It remains unclear whether Hamas's military wing in Gaza, the Izzedin al-Qassam Brigades, had a hand in organizing the kidnapping. If Israeli intelligence determines that it did, that could place the Hamas regime in Gaza and Israel on a speedy collision course. Alternatively, should violent clashes erupt in the West Bank in the course of future raids, terrorist factions in Gaza could begin firing rockets into southern Israel. The IDF says it is acutely aware of the possibility of a security escalation in Gaza, and has deployed Iron Dome anti rocket defense systems across southern Israel in anticipation. For now, however, Hamas in Gaza appears to be deterred, and Hamas in the West Bank is at the receiving end of an Israeli clampdown not seen in many years. The coming days will reveal whether the situation will escalate further, and, perhaps, the fate of the three kidnapped youths. Aziz Dwik aka Dweik. He was the Hamas official that met with the UC Irvine-sponsored Olive Tree Initiative in 2009. That was a meeting that the OTI officials tried to cover up until it came out a few months later.